Hello hello hello, and we have moved. I'm sitting at the table at our new house staring out at our neighbors' houses and the street. Lucy June is cooing in her seat next to me (because she's perfect,) and Jake is being entirely too quiet for comfort, but dammit if I don't want to write a little something. This house needs some permanent marker on the walls anyway. Moving. This move is taking forever. Jacob is working every day and most days he puts in over 12 hours, and just how much I can't do by myself stares me in the face day after day. Lunch: Where are the brownies? But every day is a little bit better, a little more normal, a little more put together. So let's link up with Hallie and focus on some favorites today. For the past month of traveling and holidays and moving, my kids have been in disposable diapers. I was both appalled by the waste and in love with not having to do diaper laundry. Every time my newborn pooped immediately after I changed her diaper, I would suffer so much guilt over the 15 second life of this disposable that would now spend the REST of TIME in a landfill. But every time I would run a massive toddler bomb to the garbage outside, I was thanking God I didn't have to rinse that sucker in the toilet. But then there was the moment when I reached into the plastic bag and came up empty-handed while my toddler's naked bum grinned up at me - and well, Size 1 plus duct tape and a trip to the Grocery store later, we were mostly unscathed - but that was decidedly UNfun. Anyhow, yesterday I unpacked my box of beautiful, soft Clotheez prefolds, and I knew I was home. 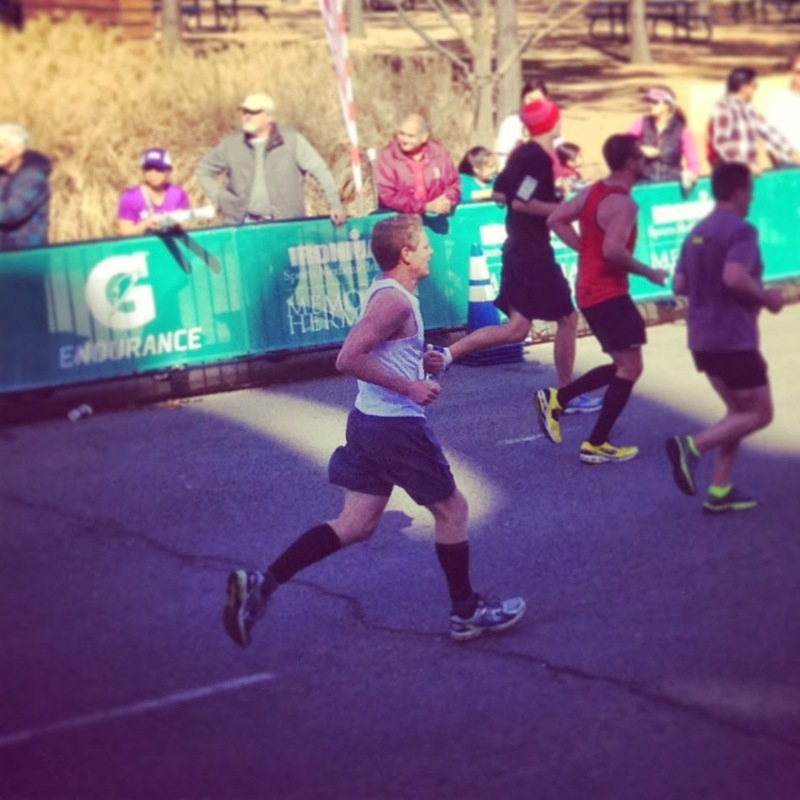 My Dad's running. Dad hatched a plan about ten years ago that involved qualifying for the Boston Marathon when he aged into the 60+ bracket. And he did it! Here in Houston! Last weekend! I was more than proud. I cried. Like three times. 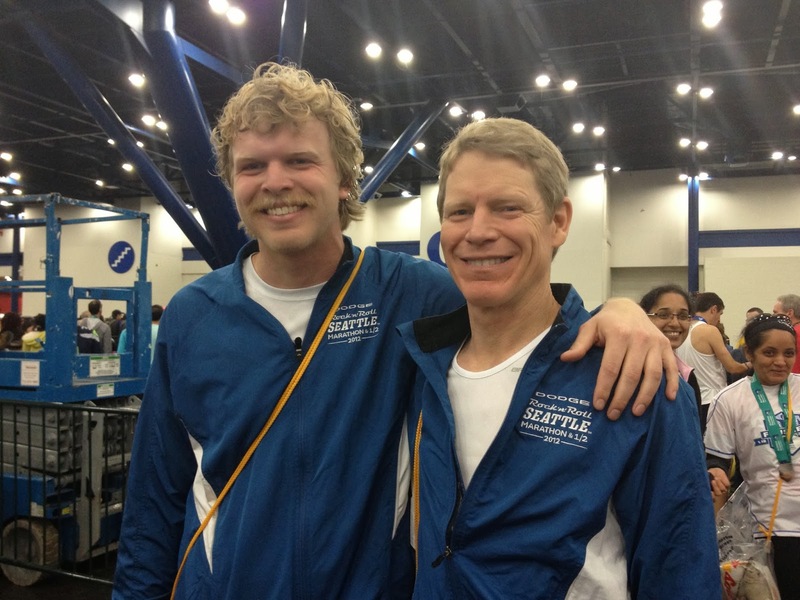 Post race pic of the runners: Dad and his oldest, Prefontaine. So proud. So so proud. This is a journal for Catholic mothers that I've been receiving for the past few years. I was introduced to it by a friend in Southern California. You can sign up to receive them for free because they operate on a donation-only basis. 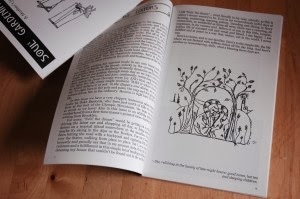 They put together each edition as soon as they have the funds, so you never quite know when you're going to get one, but when they come I get so excited. I read it in bits and pieces and stolen moments of quiet coffee drinking. The articles are so enriching and they have the most endearing illustrations. Anyhoo. Go put yourself on their mailing list and enjoy yourself some printed word every few months. And after you decide that you love them, throw them a donation so they can keep the journal going. Jessie wrote the best post about dating her husband while the littles tag along, and I crack a smile every time I think about it. "...we realllly like our pale ales and buffalo wings and plush booths and dimly lit locales. Therefore, we take the kids." "There's an inevitable eye-lock between Sean and I at some point during every one of these "dates" that translates clearly to "why do we do this?" We do it because it is, ultimately, a good time." I know. I know. It makes me happy too! Emily wrote a post about divorcing her two year old from her pacifier. "...*Ryan would like me to edit this by saying he has been totally against the pacifier past age 1.5 (puhlease) and it’s only because of his wife’s weak will that we continually caved to Anna’s paci (!!!!!!) demands. In summary: the entire situation is arguably my fault and he allowed it to continue because all of my extensive de-pacifier plans and theories on parenting this particular battle were mildly entertaining until recently when they started to cross over into the ridiculous." Emily wrote this about the little victories in toddler parenting, and in the words of my son "Iss my FAVOrite!" Go see Hallie and the Favoriteers. Just signed up for the Soul Garden mailings - they look so darling! Thanks for the tip! Soul Garden ~ thanks for the heads-up and the other great links. Oh I hear you on the diapers! We did a bit of traveling over the holidays and I ended up just doing disposables because it was easier. But it's so disappointing knowing that diaper only lasts once. I just signed up for the Soul Garden mailing list! Thanks! I really cloth diaper because I'm Mrs. Stingy McStingy, but I pat myself on the back because it's green. Oh, I'm glad you signed up for the journal. I hope you enjoy it! I love this post so much. Congratulations on your move!! I ate take out for a month straight when we move, so you're doing much better than I did! I just signed up for the Soul Gardening Journal, and I'm so happy you posted about it because I remember you telling me about it when I was at your house last before you moved. Can't wait to get it in the mail! I use cloth, too, but I've never rinsed one in the toilet. What gives?! I don't rinse my newborn's diapers, only my toddler's. I was coached to rinse out the diapers as soon as a significant part of baby's diet is solids, but that said, I know diaper mamas that don't rinse. But you could pretty easily talk me out of rinsing toddler diapers if you've successfully not rinsed them. What's your routine??? We do have BumGenius(?) flushable liners, but I only used them a couple times because the old plumbing at our last place couldn't handle them and they would get backed up. Have the liners ever clogged your toilet?? And how do you put them in the diaper to make sure they don't get all wadded up and actually do their job effectively?? You've given me some hope!! Thanks for the tip on the journal. And WOW your Dad's THE MAN! You are the greatest bec this so encourages me to keep the divorce final!! She is a tough one that kid...when I denied her 5 millionth request for her pacifier before 6AM, she said "I think mama needs to go to Church today." Who is this child? Teenage years are looking bleak. And...I went to Church today. I was introduced to you through Camp Patton, and now you've introduced me to Soul Gardening. What a wonderful little world we live in. Thanks for sharing! Your daily menu sounds all too familiar. Except mine is "where are the chocolate chips?" and dinner is chai. That you made. And sometimes I'll roast a sweet potato. Tell me you and Jacob have had these situations as parents of two. All you want is a drink and a different wall to stare at than your living room's...and all the sudden you're high-tailing it out of a public venue like you robbed the joint. Bonnie&Clyde style. oookay ps I'm using my sister's computer and this is not, in fact, annaschuberg, but Jessie Pope. My bad. 1: (in a hushed voiced) Landfill and I have an understanding. 2: I can't run past the letterbox, so i'm proud of your dad too. 3: I'm going to sign up right now. My FIL has bought us 2 Catholic subscriptions but i find them a bit heavy going, this one however, looks beautifully simple. I look forward to it. Do they send to Oz? 4: Date night…hmmm. We used to take all 4 and sit, eat, pay and run in about 20mins flat. Now, thanks be to God and parents living close, we go on our own and hold hands! Who would have thought it possible! 5. Dummies. 2/4 had them…..a godsend and a devilsend! The last happened to be taken by a bird as we fly down the freeway at 110km….pathetic story but it worked. He cried for 40 mins (nearly killed my heart) but we both got there! Your Dad is incredible. Wow. I know I'm ruining the Earth, but if I want to be sane, I must use disposable diapers. Sorry! Question: Would you do cloth diapers if you didn't have laundry in your unit? I'm thinking of doing it while I'm at home, and then when the baby is in daycare (sob) doing huggies naturals. The service is $24.50 a week though, so I'm trying to weigh the cost/benefit. Also, do you use covers and if so, which ones? Honestly, I wouldn't. I would just use disposables, and I wouldn't feel bad about it either. I say wait till you have your own washer/dryer and then embark on cloth. 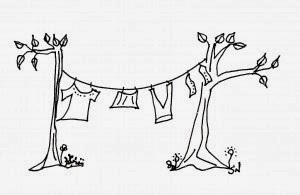 However if you are interested in cloth diapering with coin laundry I think Martha of Romancing Reilly might have some wisdom. If you're interested in building a cloth diaper stash, I still think it's a good idea to register for some.